I can’t lose weight no matter what diet I try. I’ll work out once my life gets less busy. I want to lose weight but I don’t have time to cook healthily. I’m not motivated to work out. If they do, you’re not alone. Trust me when I say I know there are obstacles that stand in the way of getting in shape. There never seems to be enough hours in the day, and it’s easy to feel unmotivated and overwhelmed. But no matter what you feel stands in way of reaching your fitness goals, I have one idea that may change your approach: take baby steps. The key to overcoming the obstacle of feeling overwhelmed or defeated is to make your goal smaller. For example, write down a goal to lose three pounds. Don’t think about the looming 30 pounds total and how are you ever going to make that happen. Instead, think about the next three pounds and that’s it. Don’t let your mind go beyond the next three pounds. When you are three pounds down, take time to be happy about it and congratulate yourself on what you have accomplished, and then set your next small, immediate goal. Speaking of starting small, try some of our amazing 10 minute workouts! Fit them in at any time of the day, and choose from tons of different workouts. Another way to take baby steps is to add a new healthy habit each week. Just add one each week. Every Sunday, come up with a new, small habit you are going to adopt. Think about how much change you could create in your life if every week you ADD a new healthy habit. That’s about four new habits per month, 48 new healthy habits per year! You can pretty much guarantee those weekly habits will add up to an improved you! Some habits you could add include: drinking more water, introducing strength training, or starting a food journal. Try freezing a smoothie and then take it to the office for lunch. Or begin eating yogurt and fruit as your dessert, pack your lunch, try a new workout, or up your intensity of your exercise. There are numerous ideas you can try each week. Just remember to keep adding habits—because it’s your compounded efforts week to week that will bring about real change. Lastly, take away a bad habit each week. What habits can you get rid of? Your health also can be vastly improved by things you stop doing. Can you give up soda? Eat a little less sugar each week? Stop buying foods that tempt you while you are at the store? Stop eating directly out of a bag or box? Eliminate a few processed food items from your grocery list? Stop avoiding workouts? Stop having second helpings? Each week, select one thing to stop doing to improve your health! 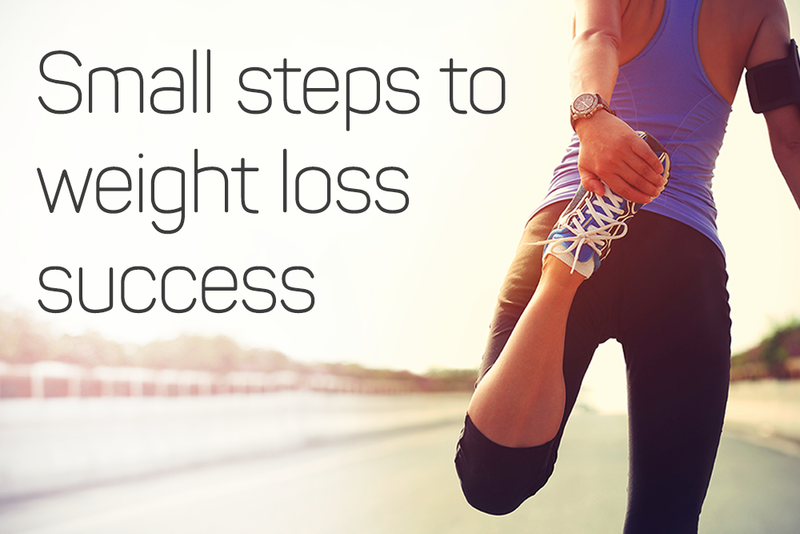 These three steps for weight loss success can trick you into a healthier lifestyle by slowly introducing change into your life. Before you know it, you will love the changes you see and feel! Hi Melissa. So glad you reached out. Perimenopause and menopause can be a very frustrating time. The first suggestion I have is to read our article Am I Crazy or is It Perimenopause. This will give you an overall scope of what is going on and what the best options are. It’s a great place to start. In terms of your weight, it might be time to shake things up. It seems you are saying that whatever you’re trying isn’t working. First: start with a clean diet. I’m guessing you already work on this, but keep at it. Fresh, real food: lean meats and protein, lots of fruits and veggies, etc. Second: Don’t skip weight training. You need to continue to build muscle on your body for many reasons including bone density, strength and – per your complaint – metabolism! Finally: I highly encourage you to do a couple high intensity interval training sessions twice a week. This will shake things up and give your body a boost you need. We have so many options on GetHealthyU TV. A good place to start might be our 10 Minute Tabata Bodyweight Workout. Hope this helps! Hang in there!